Research in my lab is devoted to the discovery of cellular and molecular mechanisms of dementia. We are specifically interested in Alzheimer's disease, Frontotemporal Lobar Degeneration and Neuroinflammation. We are using interdisciplinary approaches ranging from biophysics, biochemistry and cellular and molecular biology to in vivo models and life imaging. The laboratory is divided into several research areas including: Protein shedding by α- and β-secretases, Intramembrane proteolysis by γ-secretase and Frontotemporal Lobar Degeneration. Our work is embedded in the Munich Cluster for Systems Neurology (Synergy). 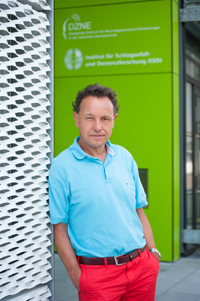 The division of biochemistry is a partner institute of the German Centre for Neurodegenerative Diseases (DZNE).